If you need to kickstart a smart home setup or add some final touches, this bundle will save you about $30. 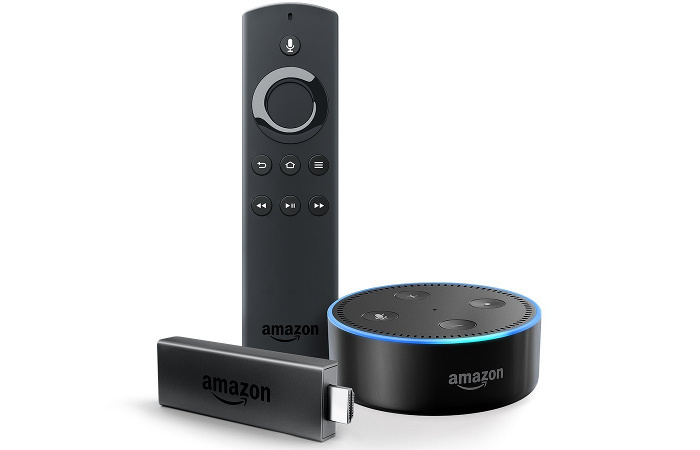 Amazon has a new roster of Echo and Fire TV devices, and it wants you to join in the smart-home madness with a special bundle. Right now, you can get last year's Fire TV with the Alexa Voice Remote and the second generation Echo Dot for $60. That's $30 cheaper than it would usually cost to buy these items together. If you're more interested in new items, you can pre-order the Fire TV 4K with Echo Dot for $80. That bundle will save you $40 off the usual price, as the new Fire TV is priced at $70. The downside is you'll be waiting a few weeks, since the bundle doesn't ship until Wednesday, October 25. Because the newer 4K version was only recently announced, we haven't reviewed it yet, but we did like the 2016 Fire TV Stick when we looked at it last November. Since then, the Fire TV interface has (mostly) improved—and it now includes Echo integration. As for the Echo Dot, we recently published a comprehensive guide on all the available first-party Amazon Echo devices, and what they're best suited for. As the cheapest Echo device at $50, the hockey puck-shaped Dot is ideal for anyone who needs a smart speaker to control their smart home devices such as the Fire TV stick, smart thermostat, and smart lighting. Its speaker isn't as good as those of its larger cousins, but the Dot can connect to existing sound systems via an analog audio output or Bluetooth.